Home Basic Date Questions Conversion Problems How to convert Date to LocalDateTime in Java? Write a program in Java that converts current Date to LocalDateTime. Date class is present in java.util. * package and LocalDateTime class is present in java.time. * package that is part of Java 8 API. Date class returns current time and time zone along with current date but LocalDateTime class returns current date and time. This conversion is very useful for large projects because it is a very basic problem that you should be aware. Note : Java 8 is required to run below code because LocalDateTime class is in Java 8 API. // Get system default time zone id. // Convert Date to Instant. Output - How to convert Date to LocalDateTime in Java? 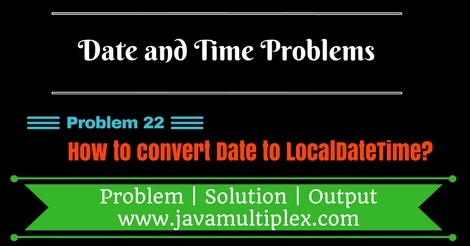 How to convert given Date to LocalDateTime in Java? Tags : Date and Time problems, Conversion problems, Date to LocalDateTime in Java, Solution in Java, ZoneId, Instant.